The Italian Greyhound is an agile and exceptionally playful dog that expends more energy than most other dog breeds. Feeding this dog the quality food it needs to match its expanding energy is the number one responsibility for owners of this awesome breed. 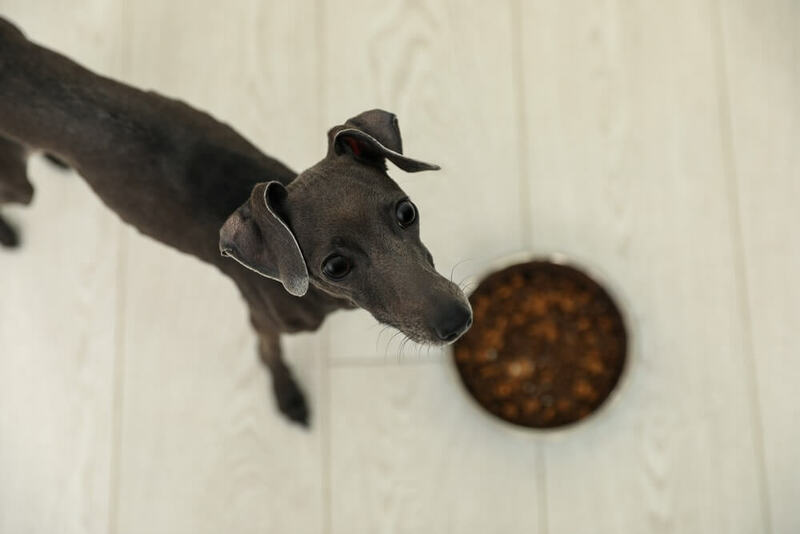 So when you're setting out to plan a diet for your racy Italian Greyhound, figuring out which brands offer the optimal nutrition and satisfies his bottomless pit of a belly can be kind of challenging, especially to new pet parents. We've consulted with several dog breeder and trainer specialists to work out exactly what your Greyhound should be eating. We've put together a short guide of recommendations for some really great dog food brands. So let's get started! Something you might not know about Italian greyhounds... They demand cuddles at all times. Intelligent, affectionate, kind mannered and playful. Fractures, epilepsy, Progressive Retinal Atrophy (PRA) and slipped stifle. You can read more about this special breed by visiting the AKC website. Quite often young, Italian Greyhounds burst into vigorous leaping and running around the yard with great recklessness. Without proper diet, these sudden leaps and runs often result in the breaking of their fragile legs. This often results in additional expenses when caring for your dog. What foods to feed a Italian Greyhound? When was the last time you enjoyed a meal made up of cereals exclusively? I guess your answer to this question is never. Yet this is how most people feed their dogs, using the same type and brand of food week in week out. Most people do this because they believe that it is the right way of feeding their pet. Well, if you have been doing this, you are wrong. A healthy Italian Greyhound should be fed on a rich mixture of commercial and raw food diet. Commercial dog foods often contain the optimum balance in key nutrients like protein, carbs, fats, minerals and vitamins. Most dog breeds however will do well on just commercial dog food. For your Greyhound, consider dry food brands like Natural Balance, Solid Gold and Buffalo Blue since these have the sufficient levels of nutrients this breed requires and are trusted brands for providing quality nutrition. These commercial brands also offer their foods in wet form so that you can mix with their dry feeds and make it more palatable for your dog, if you choose to do so. To keep their diet interesting ensure that you also give him a fair share of raw foods such as meaty bones and raw fruit and veggies every week. The Italian Greyhound also requires ample supplies of fresh water every day. Water plays an important role in digestion especially when he is fed dry foods. When to feed to a Italian Greyhound? The Italian Greyhounds just like most other medium sized dogs don't have special needs that will require anything else other than quality feeds. To ensure that your pet remains healthy it recommended that you feed it several times a day. In fact, puppies younger than six months should be fed 7 to 8 times each day, those between 6 months to 1 year should be fed 6 to 7 times each day and those older than 1 year should be fed at least 5 times a day. This will ensure that the dog gets all the nutrients it needs spread throughout the day. How much food to feed an Italian Greyhound? Most people don't know how a well-fed Italian Greyhound dog looks like. As a result, often many people try to overfeed their pets so that they can resemble the stocky breeds. The truth is the Italian Greyhound is a lean dog and trying to make it look stocky can lead to obesity which is a health risk in many dog breads. You should give your Italian Greyhound fresh and sufficient food that provides all the nutrients that it needs to lead a healthy and active life. The dog label will come with instructions as to the feeding guidelines to feed your adult, puppy or senior dog. During every feeding leave out the food for about 20 minutes and no more. This is enough to keep them going until the next feeding time. Don't be tempted to feed him as much food as it can eat in a single sitting as dogs just like humans tend to overeat when there is more food lying around. The gum disease is common in Italian Greyhounds that are left to do their own grooming and those fed on a poor diet. The ailment affects the teeth making it difficult for the dog to feed properly and thus affecting the overall health of your pet. To protect your dog from this disease ensure that you feed it on a quality diet and you also keep its hygiene high. For a more detailed description and how you can help prevent it visit this page. Pancreatitis is also another common disease in this breed of dogs. Quite often a dog suffering from this condition will lose appetite, experience belly pain, and vomit. Some may have diarrhea, dehydration, and experience an irregular heartbeat. The best way to prevent this condition from occurring is by watching what your dog eats. Reduce the amount of high fatty foods that you feed your dog with and instead give your dog more raw foods full of fibers and nutrients. In addition limit, the amount of human foods that you give to your dog as some of these foods are toxic to the dog. For more specific information about this condition, visit this page on pets.webmd.com. Italian Greyhounds are small sight hounds that are known for their small heads and tucked up bellies. They have long, slender legs that make them fast runners. These guys can reach speeds of up to 25 miles per hour. Since they are so slim extra care must be paid to their diet in order to maintain their already fragile bones healthy. 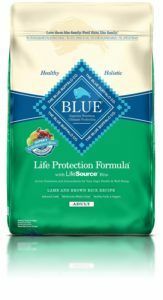 Blue Buffalo Life Protection Formula Lamb and Rice is a healthy and holistic dry dog food made with deboned lamb, whole grains, and healthy fruits and vegetables. This is good for all dog breeds and sizes, so it's perfect if you have more than one type of dog at home. This formula is fortified with calcium, phosphorus, and essential vitamins that are great for helping maintain an Italian Greyhound’s strong bones and teeth. If you feed your pup only wet food, incorporating this dry kibble to his diet will improve digestion. Blue Buffalo also includes glucosamine for joint health and better mobility along with proteins and carbohydrates to give dogs the energy to enjoy an active lifestyle. Like most highly recommended dog kibble brands, Blue Buffalo contains Omega 3 and 6 fatty acids for to make sure pets have healthy skin and coat. Made in the USA, Blue Buffalo Lamb and Rice uses responsible sourced products and guarantees that its dog food is free from corn, wheat, soy, and chicken by-products. While rice is often regarded as filler, the use of whole ground brown rice (a type of good complex and easy to digest carbs) provides greater nutritional value than other types of carb-based fillers you might see in other dog foods. Italian Greyhounds do well on this food, it is pesticide-free and non-GMO and pups are happy, healthy, and energetic. Vets recommend this brand for dogs with skin and digestion issues and even the pickiest of dogs enjoy the taste and texture of this kibble. Blue Buffalo is a perfectly great solution for your Greyhound's overall nutrition. Great alternative to poultry kibble. 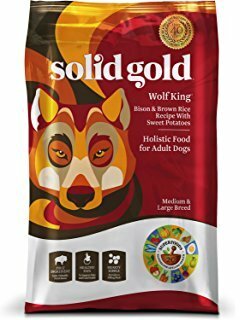 Solid Gold Wolf King Adult Dry Dog Food is a holistic food for medium and large dog breeds of all ages. The first ingredient in this formula is fresh, lean bison along with a blend of whole grains and super foods like blueberries, pumpkin, almond oil, and broccoli for optimal pet health. 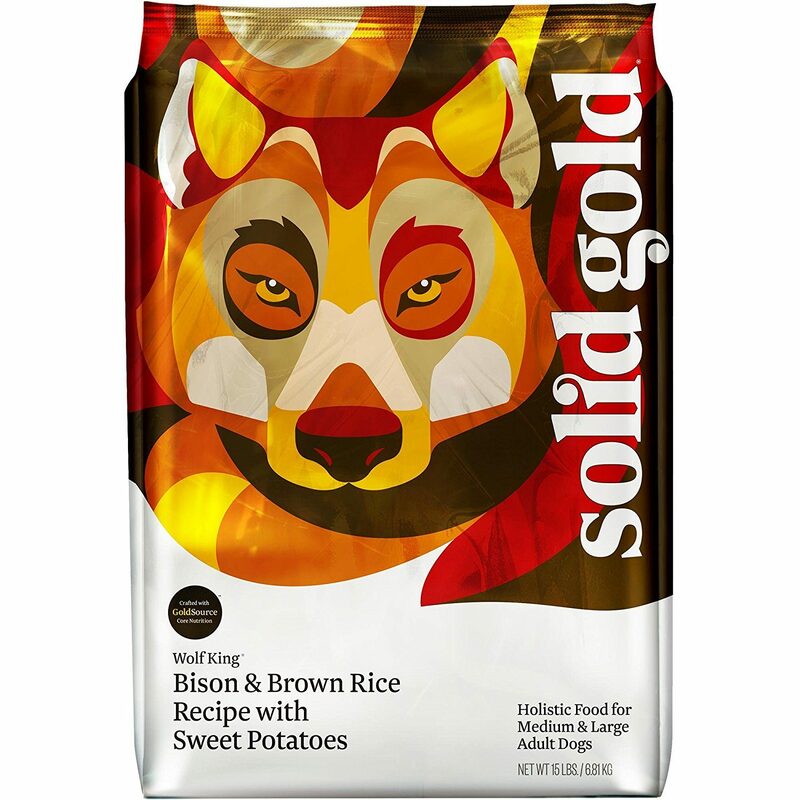 Solid Gold is a trusted American dog food brand with over 40 years of experience creating nutritious dog food that leads to great results. We particularly like the use of healthy and complex carbohydrates of brown rice and sweet potatoes in this formula. In addition to trusted ingredients, this recipe, also includes monounsaturated fats to keep your Italian Greyhound’s skin and coat healthy. This brand never includes wheat, corn, soy, wheat, meat by-products, or artificial colors and flavors in their dog kibble, so you can feel great about feeding it to your furry companion. Pet owners and vets recommend Solid Gold for dogs with digestive issues after seeing big improvements after switching to this brand. Owners love the natural ingredients and have also noticed that their dogs' coat and skin are healthier after switching to Solid Gold. Many have also found that their dogs have more energy after switching to the higher quality kibble. Even picky dogs seem to enjoy this food blend, and is a great alternative to poultry recipes which is ideal for greyhounds with food allergies. It’s great for dogs with allergies. Natural Balance L.I.D Sweet Potato & Venison Formula Dry Dog Food - uses venison as the main protein which is a great alternative to poultry - which can sometimes ignite skin allergies in dogs. It is also free from grain, corn, or wheat and uses selective protein sources to help with digestion. 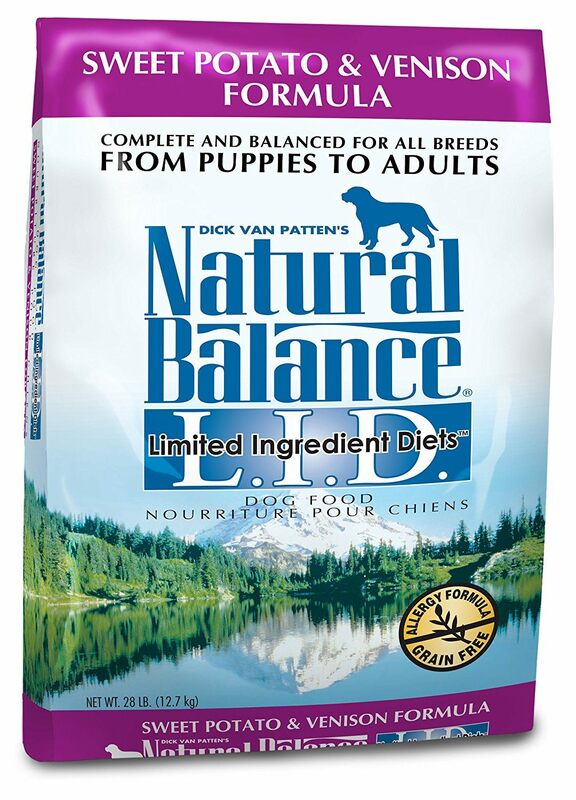 Natural Balance is fortified with Omega 3 fatty acids to maintain your pet’s healthy skin and coat. The recipe also includes Taurine to help prevent heart disease and mixed tocopherols to contribute to a healthy immune system. 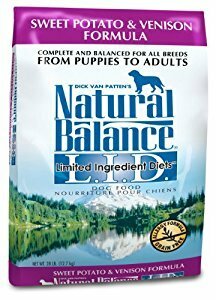 Natural Balance does not use any artificial flavors, colors, or bleached ingredients that are in a lot of cheaper dog food varieties. In addition this blend can be fed to either a Greyhound puppy or older adult dog since it is a complete and balanced formula. It is limited ingredient formula and doesn't use poultry as a protein source - so it's a another suitable dry food for dogs with allergies. Although we wish this food had higher amounts of protein, Natural Balance L.I.D. Sweet Potato & Venison Formula is still a great alternative with plenty of nutrition and dogs do well on it. Reports of reduced shedding is a common theme with this dog kibble. In addition, pet parents have seen improved digestion in their dogs after being vet recommended. So, What's the Best Food Brand for Italian Greyhounds? Blue Buffalo, Solid Gold and Natural Balance all have great options for dry dog kibble that can support the energy requirements of an active Italian Greyhound breed. To have a happy and healthy pet, pet parents should feed their dogs high quality food with digestible and dense proteins and low-glycemic veg and carbs! Each of these brands pride themselves on using great, US based sourced ingredients and make great choices of dry food for your bundle of joy!